Is your hair visibly thinning? 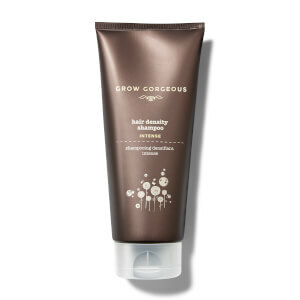 Restore tresses to their full potential with the Grow Gorgeous Thinning Hair Rescue Kit. Whether you’re looking for on-the-go essential hair care for lacking locks, or an intro to the GG Intense Range, this concentrated regime for hair and scalp is a saviour for thinning hair. Containing a travel-sized Hair Density Shampoo Intense and Hair Density Conditioner Intense infused with Caffeine, Biotin and Hyaluronic Acid and a full-sized, highly-concentrated Hair Growth Serum Intense. Use together for a visible improvement in hair appearance: density, fullness and thickness. Chic travel bag included. RRP £50 (Worth £69). Infused with Hyaluronic Acid to moisturise your scalp, it also contains Bio-Active Pea Sprout Complex helping to activate and improve hair density. With a high concentration of caffeine to really wake up the hair follicles plus a glucoside compound which actively increases hair density. Directions for use: Cleanse hair with the Hair Density Shampoo Intense and follow with the Hair Density Conditioner Intense to clean, nourish and thicken strands. Apply the Hair Growth Serum Intense daily to complete the regime. Hair serum smells amazing also I used the split ends one which works wonderfully and leaves the hairs smelling gorgeous !